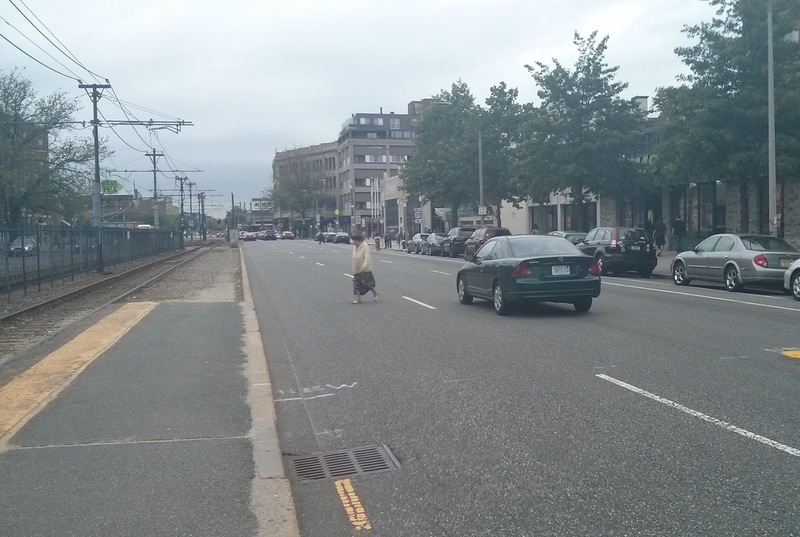 The Walking Bostonian: Fifty years of the MBTA: where is the vision? 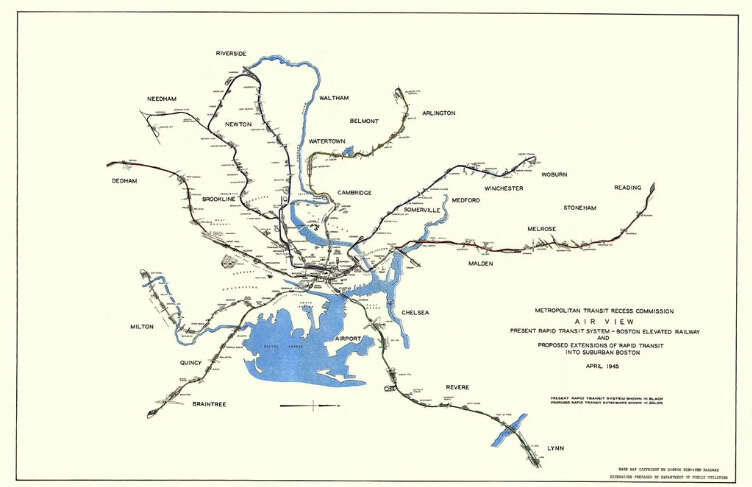 Fifty years of the MBTA: where is the vision? Yesterday, I was riding the T towards home with a friend who lives nearby me, and I mentioned that I had canceled my monthly pass for the remainder of the summer. The value proposition just isn't there for me anymore. At least, so long as the weather remains decent, I'm not sure I will be able to use up $75 in stored value. He said that he was mulling the same issue, because at $75, it was more of a struggle for him to afford. But then he surprised me: "the fares go up regularly now, but the MBTA has no vision, no plan for improvement, no sense that things are going to get better in the future." This is coming from a person who is just a regular user of the system, not someone who probably spends too much time thinking about urban transportation issues. And, I have to admit that I am forced to agree with him. Today is the fiftieth anniversary of the formation of the Massachusetts Bay Transportation Authority from the ashes of the Metropolitan Transit Authority, on August 3rd, 1964. The new authority was intended to unify mass transportation operations in the greater Boston area under one umbrella, a much larger scope than the old MTA. And in some aspects, it has been successful, or at least, impactful. The iconic Ⓣ logo, the famous color-coding of rapid transit lines, the death and rebirth of commuter rail, the consolidation of management, the expansion of the Red Line, the controversial Orange Line relocation, and many other things. The long term vision for the MBTA is called the Program for Mass Transportation (and yes, there is a broken link on their website, and this is where it's supposed to go). If you look through the Progress document, you'll see that most of the accomplishments are things like replacing vehicles, doing maintenance on right-of-way, improving accessibility, etc. I do not want to disparage any of those activities: they are very important for the proper functioning of the system. But they are not the kind of accomplishments that are going to constitute a "visionary step forward" for transportation in the Boston region, as seen by ordinary users. Actually, most of what's listed under progress are fixes that should be taken as a matter-of-course: yes, stations should be accessible, vehicles should be in working order, and tracks in good repair. That goes without saying, really. West is up. Also see: Larger version. The MBTA has been dragged, kicking and screaming, to build the Green Line extension to Somerville and Medford, and it seems to be finally happening, 70 years after it is proposed on the above map. One difference: a second branch will be included, to Union Square. The Orange Line was relocated, by the MBTA, to the Southwest corridor as part of the highway moratorium deal. I can hardly blame the Boston Elevated Railway company for not foreseeing the destruction of all elevated railways within Boston. But they did plan for a West Roxbury extension of the Orange Line, which the MBTA abandoned when blocked by NIMBYs, and is now sorely needed. The shown Reading extension of the Orange Line was planned and abandoned by the MBTA, leaving a vestige third track alongside portions of the Haymarket-North route. The Blue Line extension to Lynn, abandoned by the MTA in the 1950s due to lack of money, but not forgotten. A rapid transit expansion along the Framingham commuter rail tracks/I-90 right-of-way that passes through Brighton. A small portion of this is covered by the Orange Line today. Although this looks something like a "visionary plan" (hey, it says "Vision"), it's actually rather disappointing, despite the busyness of the map. In 1945, the transit commission envisioned vast sweeping expansion projects that would unite the region. In 2014, MassDOT envisions dinky diesel powered traincars that, at best, come every 15-20 minutes and only cover a small amount of territory. Also, several of the proposals are dead on arrival. Cambridge won't tolerate frequent closings of crossing gates on the Grand Junction, they even rejected infrequent commuter rail. The Track 61 connection between Back Bay and the Seaport is completely absurd, as it crosses just about every south-side railroad line at-grade. West Station is still hot air, despite recent commitments to plan it as part of the Allston I-90 Interchange Improvement Project. Implementing energy efficiency policies: yay, but again, not visionary. Continuing to fix accessibility problems: necessary, and should go without saying. Bus Rapid Transit-like service on key bus routes: interesting, but they sink themselves by saying things like this, "a careful study of roadway geometry and traffic congestion is needed...," which makes it clear what the priorities are. Hint: cars are still considered more important than buses, in the eyes of the transit agency. In Beverly, a brand new $34 million palace for 500 cars: $68,000 per parking space. The difference is simple: the MBTA primarily sees itself as a means for getting 9-to-5 commuters from parking lot to downtown office building. Their decisions make a lot more sense when viewed in that light. Of course, not everyone thinks like that, and there are good folks there trying really hard to make things better. But institutionally, the agency was born in 1964 and still thinks like it is 1964. The Red-Blue connection at Charles/MGH. An essential item if looming passenger capacity problems at Park Street are to be tackled. The Big Dig mitigation agreement required merely the design of the Red-Blue connection. Yet, the MBTA has now successfully dumped it. Even though doing the design would be cheaper than building the parking palaces on the North Shore. The Silver Line Phase III, which would unite the two halves of the Silver Line with a superstation underneath Boylston Station. SL-Waterfront is currently only connected to the Red Line at South Station. That was not intended to be the final state, and the line struggles as a result. Yet, Phase III was completely insane, and would have cost many billions of dollars to build, while digging up and throwing into disarray some of the most sensitive parts of historic Boston. As a result, it will never happen, and the Silver Line continues to look like one of the worst ideas in MBTA history (although it is an example of a non-BERy-planned expansion). The North/South Rail Link between North and South Stations. This was supposed to be part of the Big Dig and was deferred due to the collapse of that project's budget. If done correctly, the North/South Rail Link can be combined with a radical transformation of the commuter rail system to produce express rapid transit similar to the RER. That would be visionary and transformational to the region. Naturally, the MBTA has no interest in that, and may have actively sandbagged the proposal. Things like South Coast Rail, now costing $2.3 billion, to serve 4,500 people. You know how I feel about this one. So that's where we stand with the MBTA's vision. Parking garages, dinky diesel powered traincars, insanely expensive commuter rail expansions, and a lot of pie-in-the-sky proposals. Mostly a collection of pet ideas and political footballs, really. I think part of the problem is that the MBTA only sees itself as a transportation agency. It's a part of MassDOT now, which makes it part of a larger transportation agency. The same problems occur at the higher level too; we have seen, as MassDOT works on redesigning the Mass Pike through Allston, they insist on compartmentalizing themselves with the "we only build roads" attitude. Models are almost entirely useless, because the interaction between human beings and their built environment is too complex for us to reliably predict most things, especially decades in the future. Instead of trying to predict the future, focus on providing strong urban corridors that can adapt to any conditions. For the transportation side, that means safe, walkable, bikable streets with frequent, reliable, convenient and accessible transit service (of any mode). For the land use side, that means mixed, intense, diverse use that keeps the human scale in mind. To MassDOT: uphold the GreenDOT principles, the Mode Shift Goal, and the Healthy Transportation Compact. To MBTA: strengthen your frequent bus network through expansion and upgrades. Use "BRT" features on every bus route: off-board payment, all-door boarding, level-boarding, signal priority, bus lanes, etc. Stand up for your customers: don't be afraid to confront the automobile lobby when it's stealing resources away from bus riders. When designing and rebuilding suburban rapid transit and commuter rail stations, they should, as much as possible, be the core of a walkable town center -- not a parking lot desert. To MBTA commuter rail: it's time to stop operating like it's the 19th century. Start moving towards reliable frequency, all-day, supporting two-way travel wherever possible. Don't be just a parking lot shuttle, be a connection from the small, walkable town center to the larger region's opportunities. To urban/land use planners in the region: don't zone yourselves out. There's huge demand for nice places to live where it's not only safe to walk and bike, but also convenient and enjoyable. We used to build such places, until mid-century zoning made it illegal to do so, instead choosing to chase the impossible dream of automobile travel everywhere, all-the-time. Help build strong urban corridors through walkable neighbohoods, corridors that can be effectively served by transit, and work together with the MBTA to make it a reality. But the idea was to create a vision of where the MBTA and the city could work together in creating strong urban corridors, mostly based on existing bus routes. 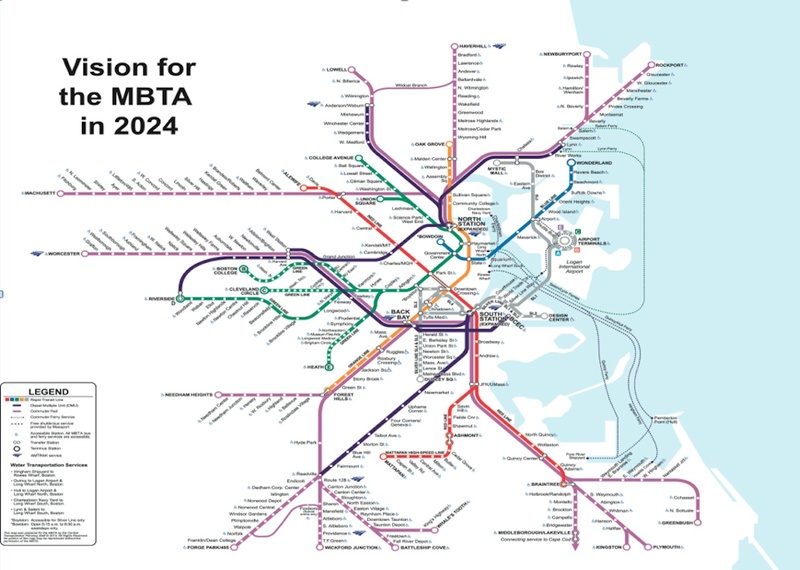 If the MBTA published a vision in this mold and said that "by 2024, here's where we want you to be able to catch a bus or a train within 10 minutes of showing up," that would be exciting. And if the city came along with a similar plan that said, "here's where we're going to focus on bringing economic development, on increasing housing supply, on fostering diversity, on walking, biking and safer streets," and that plan largely concurred with the MBTA's plan, then that would be exciting. And perhaps, it would represent a realistic vision that regular residents and riders could appreciate. 1. Finish the Fairmount Line improvements and stations, electrify it, and run it like a rapid transit line. Every 10 minutes. Right now it's scheduled to make the run in 25 minutes, and that's with diesel acceleration. If you get it down to 22 minutes, even with changing ends, it probably means that a train set can make a round trip in an hour, so you'd need, say, six three-car sets to run full service (and a couple spares. 24 cars. Costs? The track is there. Figure $50m for electrification (high voltage AC can connect at either end to the current power system, so all you have to do is string the catenary). $100m for the rolling stock. For $150m, you get a full rapid transit line serving one of the lowest income parts of the city, and with a lot of developable land nearby. There's no reason you couldn't have 5,000 very transit-oriented units hugging those stations. Huge real estate potential. 2. Grade separate the Grand Junction. The issue with the Grand Junction goes beyond the grade crossings, there's just not enough room to get everything everyone wants in to that one corridor. But grade separation has huge potential. You have to get under the Red Line, so you have to tunnel 40 feet below the surface. This would give you enough room to build MIT a utility tunnel above, with vehicular access, which would be great for them. With the rail line out of the way, the surface could have a multi-use path and allow for truck deliveries. The issue in Cambridge is that the Red Line is at capacity at four minute headways, and you need to add a lot of capacity. Shuttle buses and the like are fine, but they don't solve the problem of capacity, especially with millions of new square feet of office space opening up. The city, which stands to make millions in taxes, should be a driver for this project, since it will keep the area competitive: the Red Line can only handle so many more people. The Red Line could also use another station between Kendall and Central, and there's a perfect spot south of the intersection of Portland and Albany to do that. A mostly-abandoned one story building and antiquated MIT parking garage are all that sit between the Red Line and the Grand Junction ROW. Build a new Red Line station at Tech Square on Main Street and an underground concourse between there and the Grand Junction tunnel. Operating electrified multiple units, you've probably doubled the capacity entering Kendall Square. Now, what do you connect the Grand Junction to on either end? First order of business, of course, is North Station to West Station. Run it as a commuter rail shuttle from Allston (Framingham/Worcester Line) to North Station with stops at Cambridgeport (surface, just east of Memorial Drive before an incline), Kendall Square and East Cambridge. Then in the longer run, extend it west and northeast. Going west, you provide much better connectivity to the Newtons, which have mediocre transit access to Cambridge but are very attractive to Kendall workers. 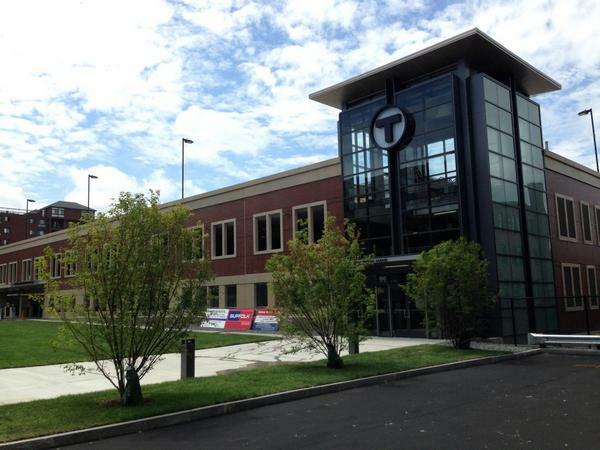 Build a park-and-ride at 128, and run service every ten minutes from there to North Station via the Newton stations, the new New Balance station, West Station and the Grand Junction, with a transfer for Worcester line passengers at West Station. Electrify it in conjunction with the Fairmount electrification. This would be a great connection between Allston/Brighton, Cambridge and North Station, and take some pressure off the Green Line, even. So, one line goes Weston-Newton-Cambridge-North Station. The second line starts at West Station, and also serves Kendall (so even if you only have service every 12 minutes on each line, the core of the service has double the frequency), but then turns northeast through north of BET with a stop at Sullivan Square (also potentially a Green Line stop near Brickbottom, but that might not be feasible). It then operates out to Lynn via the Everett Branch, with a stop in Everett (behind the Wynn casino property; every time I hear about the boats I laugh), a couple stops in Chelsea, at least one in Revere, a transfer to the Blue Line at Wonderland (about 1000 feet; an elevated walkway with moving sidewalks would be fine) and a highball to Lynn. Eastern Route trains would stop at Lynn and go express to North Station, but passengers could transfer to trains to Allston there and Orange Line and Western Route passengers could change at Sullivan Square. This is huge from an environmental justice point of view; it serves Allston, East Cambridge, Chelsea, Everett, Revere and Lynn. While it doesn't provide direct to North Station access, most destinations in Boston require a transfer since North Station is so out of the way. Instead, it provides access to each transit line, Kendall Square, and provides a crosstown connection that right now requires multiple transfers—or driving through downtown. Cost? Initial operating segment through Kendall is probably $1b for the tunnel and station, $250m for assorted track work and stations on either end, and $250m for rolling stock and electrification. Not the bang for your buck you get on the Fairmount Line, but amortized over 50 years it's $30m per year. Now, who stands to benefit? Commuters along the Turnpike corridor—so put a minor toll surcharge on driving in from 128. Cambridge, by having transit capacity to fully build out Kendall Square. That's almost priceless. But, for what it's worth, the Novartis building on Mass Ave is a $650m project. The Pfizer building is another $350m. There are probably another 10 such projects of that combined scale that could be built in the area, but transit capacity will become a major issue if it is not addressed. The City of Cambridge should make a major investment in transit, and there's a case to be made that it could leverage federal funds, since many multinational corporations are situated in Kendall Square. 3. The Blue Hill Avenue corridor. The Silver Line carries a lot of people and dead ends in Dudley. A mile south of there, Blue Hill Ave has a horrible concrete median, but it's very wide. Wide enough for a proper light rail line to run. Give it full signal preemption. Run trains at 45 mph from Mattapan to Dudley (with a street running segment for a few blocks on Warren Ave). Run those trains down the current Silver Line and in to a tunnel and the outer tracks at Boylston. Not enough space past Park? Turn rush-hour B Line trains at Park Street; the grade-separated junction at Boylston precludes any conflicts. The Mattapan Line could be upgraded to run LRVs, and the PCCs could be repurposed to run a waterfront service in the Seaport and Greenway a la San Francisco. Another underserved corridor gets better transit and a direct ride downtown. The Silver Line Phase III is put out of its misery. Lots of potential for new development, and in conjunction with the Fairmount Line, most of Boston now has decent transit connections downtown. And probably for the cost of the godforsaken Silver Line Phase III tunnel. 4. Other than a full north-south rail link (which would mesh well with #2) this is the heaviest lift: a branch of the Red Line from Harvard to Columbia (JFK/UMass) via Longwood. Longwood, like Kendall, is a major employment center with one transit line that is pretty much maxed out in capacity, and doesn't provide good connections except in a couple of directions. So a lot of people drive. That's what you want to fix. So here's what you do. In Harvard Station, there's a lot of room underground, and the old tunnel alignments to the old Eliot yard are hidden behind a false wall. Inbound Trains (lower level) branch north of the station and the platform becomes an island: trains on one side go downtown, trains on the other go to Longwood. After the platform, the tunnel dives down below the concourse (which might have to be raised slightly) before rising in to the existing tunnel towards Bennett Square. The outbound line splits off the upper level south of the platform and curves above the current concourse (the escalators from the pit might need to be relocated) in to the same tunnel. From there, they curve under Harvard Square and the JFK school, where a path between buildings was nicely left for this very purpose. They then cross the Charles, and enter a new tunnel through the business school campus (with a new Stadium station) under North Harvard Street before curving south towards the West Station, where they connect with all the lines in #2, as well as the B Line at BU. Then you have a deep tunnel under Brookline with a station near Saint Paul Street and Beacon which continues under Longwood with a station connecting to the D Line and another connecting to the E Line (each serving the medical area itself). From there, the line serves Ruggles and follows Melnea Cass Boulevard to Boston Medical Center and then using the Cabot Yard leads to access JFK UMass station, where trains would then enter one of the Red Line branches south. This, along with #2, gives you basically what you need from the Urban Ring, except with high-capacity heavy rail without grade crossings. All of the sudden, pretty much anyone who works in Kendall, Longwood and downtown can get to work with one transfer, and for huge new swaths of the area, commuting by transit becomes much, much easier. Cost for this? Probably $4b for the tunnels and stations. More the 1-3 combined. But it probably has more utility than 1-3 combined. Build these four projects, and you go from a downtown-centric system to a network which weaves the city together, provides access to the three largest urban job centers in the region and probably comes close to doubling the rush hour capacity of the rail network. If Boston is going to grow—and it already is—it can't do so with a few more crosstown buses and commuter rail extensions. Now look at me, I was going to go to bed early! It's fun to sketch out big infrastructure like that but that's actually something I was trying to get away from, because it's mostly unattainable. Perhaps you could sell Amtrak on getting funding for wiring up Fairmount, and on providing maintenance facilities for EMUs, but other than (1) I don't see any of the big earth moving proposals happening by 2024, if ever. That's why I pivoted to the frequent network plan at the end. Instead of massively overpriced commuter rail expansions, or boondoggle parking garages, let's have the T focus on building up a network of very strong, very frequent transit corridors. They've already got some of the idea, with the rapid transit lines and the key bus routes. But there's not really any muscle behind the idea of it being a fully-connected, fully-integrated, core frequent network. Currently, it's a hodgepodge of bus routes that feed into some subway stations, and it takes 3 years to shuffle bus stops around. Implementing that network could involve improvements to surface transit, like bus lanes, off-board payment, signal priority, etc. Or perhaps, to build one of the corridors in the vision, some kind of new rail link might work. I can't say in advance. But the point isn't the mode, it's the presence of frequent transit and accessibility. With a strong network as a basis, land use planners can make commitments to intense, diverse urban development in those corridors. And conversely, the input from cities and towns will inform the MBTA's planning vision as well. It has to be done together. We must avoid the situation where the land planners might create a vision that doesn't work for transit geometry. Or where the MBTA creates a transit plan that doesn't fit with the city's. Sounds like we need a Boston Crayonista Symposium, because I have all sorts of interesting lines that I want to draw on the map and ideas about how to expand and improve the MBTA. I personally think the focus should be on getting as much use as possible out of the expensive rapid transit tunnels we already have, and the 4.5 minute minimum headway on the Red Line makes me sad (compared to Moscow's 39 tph). But, as it is, I'm not sure the downtown transfer stations would be able to cope with much more ridership. Vertical farming: stupid idea, or stupidest idea?